We have just come from two back to back typhoons. One being worse than the other, although both very bad for those in their ferocious paths. Here in my corner the city, rains pounded the pavement outside my window and obscured my view of the buildings further away. The water was coming down at a crazy slant and the wind was a thing unleashed, whipping what little trees we have in a wild frenzy. But I was just side-swiped by these typhoons’ tails and trains, sitting dry in my flat and watching the world get soaked from outside my window. The worst of it are those who are hit head on…that means floods, landslides, and all manner of misfortune related to these. And when one storm follows another, even a weaker storm, it means that the floods don’t have time to abate before being stirred up again. Not good. What is good though is how quickly everyone comes together for drives to help those affected by these natural calamities. It is heartening to know, despite what cynics may say, that people still help each other out, that simple kindness is not going out of style, and that we humans really do care something for each other. On rainy mornings I take comfort in that. And in this. – Mix together oats, half the walnuts, sugar, baking powder, cinnamon, and salt in a bowl. In a separate bowl whisk together the milk, egg, half the butter, and vanilla. – Arrange the banana slices on the bottom of a well-buttered 8-inch square baking dish. Sprinkle 2/3 for the blueberries on top. Pour the oat mixture evenly over the fruit and pour the milk carefully over that. Make sure the oats are evenly coated in and around by the milk. Shake the dish a bit and gently tap on the counter to make sure the milk has reached through all the oats. Top with the remaining blueberries and walnuts. – Bake in a pre-heated 375F oven for 35-45 minutes or until set and golden brown. When done, remove from the oven and let this cool for a bit. Brush with the remaining melted butter and serve. If you want it a bit sweeter you can add a bit more sugar, maple syrup, or honey to your serving. This is another wonderful recipe from Heidi Swanson’s Super Natural Every Day. Let me tell you, I am simply enamored of this book. It is just bursting at the seams with good things. This particular good thing is heaven warm out of the oven on a gloomy rain-drenched morning, especially if you have mountain of work to get through. It is filling and fortifying and delicious to boot. Also, it will easily keep you full until lunch. I have to add that while this is lovely served fresh and warm, I also love it straight from the fridge the next day. Cold and stodgy (in a good way! ), and creamy in a way it can only get when chilled. And for a morning when I need extra fortification I’ll top a slice with a dollop of Greek yogurt, a sprinkling of homemade granola, and a drizzle of honey. The granola may seem redundant but it actually provides a fantastic contrast of textures. OMG!!! can I just order this from you?!?!! :))) looks so good I can almost smell the yummy aroma of this baked dish….lovely breakfast! That looks devilishly scrumptious! I love oatmeal. A breakfast fir for a king. This is just the dish for those dreary days when the sun refuses to come out of hiding. We were also rather insulated from the ravages of Pedring and Quiel – my first experience since childhood of baguios. It's amazing to see such resilience for those who lost their homes but not their spirits! Joey this is a great recipe. I have never heard of baked oatmeal. I can't wait to try this with other fruits that I have around the house. Scrumptious! So pleased you're O.K Joey from the wild weather. The human spirit is alive and well, but unfortunately most goes unreported compared to the nasty stuff. Hi Rosa! It really was! Hi Tracey! Yes, days like today hehe 🙂 So true about the resilience…amazing and inspiring! Hi Bron! So true! Thanks and hugs! That's some crazy weather! This dish sounds perfect for a rainy day – very comforting. I'm definitely passing this recipe along to Anthony, who eats oatmeal EVERY morning! The fact that its baked gives it an interesting twist. Oh my Jo! You've changed the way I see oatmeal breakfasts! This looks divine! I am so making this for next weekend breakfast! 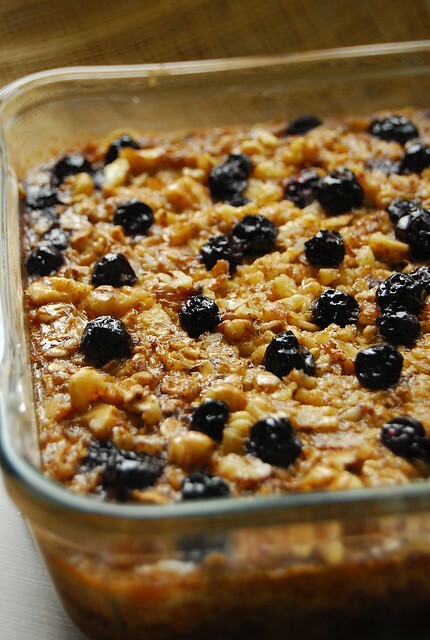 Big oatmeal lover here… this looks fantastic! Never thought to bake oatmeal outside of a cookie, come to think of it. Thanks for sharing this wonderful idea. BTW, where do you get your greek yoghurt from? Hi Anh! Hope you like it! Hi Giovanni! This would be great on a winter morning…although we don’t have any over here. We do have monsoon morning though! I just started a food blog http://www.mamaandmefood.com and after looking over other blogs, I have fallen in love with yours! I also have fallen in love with this breakfast! It looks amazing! This looks absolutely delish! Is it so wrong that I'm looking at this more as a dessert rather than a breakfast dish? I can imagine how fabulous it would be with a generous scoop – or two! – of old-fashioned vanilla ice cream! Hi Midge! Not at all…I think this would make a great dessert topped with vanilla ice cream…you could even replace the blueberries with find chunks of apple! This is definitely my kind of oatmeal and I have so many awesome ideas based on this recipe now. Thanks Joey! Oh my goodness, this looks so good! I need to make it 🙂 Thanks for sharing this recipe!! Curious if recipe calls for 1/3 cup or pound of muscovado sugar? Curious if baked oatmeal recipe calls for 1/3 cup or pound of muscovado sugar? Planned on substituting brown sugar. Would love some input.